Today we will go through some of the various themes out there on the market designed for Wedding based websites. All the themes displayed here are developed by third parties, and we do not provide support officially for any of these products. There are several reasons why you’d want to look into Wedding designs, but the cause is clear enough, someone, either you, a friend, family member or a client are getting married soon, and that’s wonderful news, or else you are offering services for wedding planning, or other wedding services. The first five themes here are meant to be used for personal couples getting married, and are therefore not necessarily suited for the portfolio of wedding photography artists, or other sorts of commercial ventures. This is a stylish, rather timeless take on the personal wedding theme. With a clean, flat feminine design, the options and customization leaves every type of user with a great end-result in a matter of hours, not days. With drag & drop builder, and the famous revolution slider, this honeymoon slash wedding theme is a great theme for WordPress. With countdown timers, pretty event calendars and guestbooks as well as RSVP forms, it doesn’t get easier than this. If you want to sell swag from your wedding, this theme also supports WooCommerce! If you want to create your own personal wedding website, then this theme is a great choice! Basically no experience is required in getting a great result, and literally 30 minutes is all it takes, if you already have your content typed up and ready to go! For the creative couple, here comes a dashing theme for weddings, handcrafted by ThemeChills, a well-known developer on themeforest. This theme is perfectly mobile ready and optimized, also known as responsive, and features many subtleties throughout the design. Apart from the name of this wedding theme, everything else is familiar and normal. What sets this theme on this list, it is the basic functionality that seems to stand out when first customizing this theme. With the basic formalities such as RSVP and Countdown until the happy day, then this is a great all-rounder. 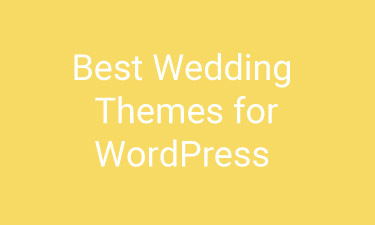 The rest of the WordPress themes on this page are meant for wedding organizers, or marriage counselors, all those other aspects of wedding templates you might think of. Excellent choice if you like a clean, corporate look to your business about weddings. Whether you plan or organize weddings, take pictures or shoot videos of them, bake the delicious wedding cakes or something else concerning the commercial aspect of matrimony, then this website design might be something you’d enjoy! Featuring Visual Composer as one of it’s main draws, Union is a clever highly stylish theme with some great benefits and addons. Apart from the main design which certainly is destinctive to say the least, the customization options really do this theme great honor. Show off your wedding photography skills, with this picture-centric WordPress theme. Designed for creative artists portfolio, this will showcase your attributes and best work effortlessly. Last up we have a heavyweight wedding theme in the form of Kinetika. Tons of features in this one, with language support, WooCommerce additions, Page Builder templates and Revolution slider the one and only. Digital vs. Traditional Marketing: Which is the Best Way to Market Your Business?